Editor/Author Harding, R., Harding, R.R. and Smyes, R., et.al. 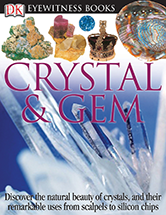 See a crystal growing, diamonds used to cut through a brick wall, gemstones formed in a volcano, and crystals of gold and silver in Eyewitness Crystal & Gem. Learn how to identify crystals, why crystals have been grown in space, how crystals are used for healing, why Napoleon had a diamond in his sword, and much, much more!